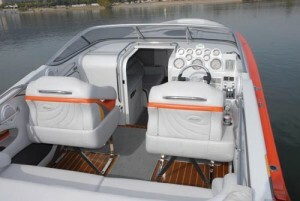 The 335-T is Hallett’s premier ‘big lake’ sportboat. Explore Lake Mead and Lake Powell in the finest multi-purpose performance boat that money can buy. Enjoy abundant seating capacity thanks to the open bow yet still have the protection and comfort of a beautifully appointed enclosed cabin. It doesn’t get better than this. Nothing cramped about this mid-cabin. Facing lounge couches are adult-sized and there's plenty of convenience storage. With the versatility of the 335-T, it's never too cold or too hot to enjoy a day on the water. 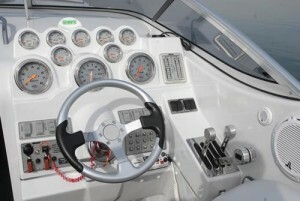 Who wouldn't want to take a turn at the wheel in a boat like this. Hallett excels at getting the details just right. Perfection at the helm is just one of many features that sets Hallett apart from all the rest. Hallett has been famous for magnificient interiors for decades. 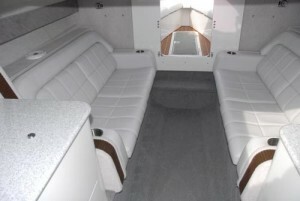 Luxurious upholstery, teak and holly flooring and wrap-around windshields are just a few of Hallett's best features. Hallett understands the need for creature-comforts in all the right places. 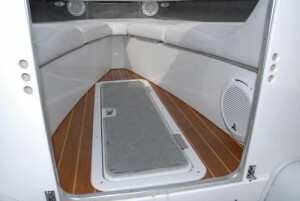 Need to store a water ski or wakeboard? How about this built-in storage locker for convenience?